Art pendants are intensely personal, brought to life by inspiration. At the close of the day, when the light fades into velvet, the ocean is drenched in deep purples and shadow. Peace is a real and tangible serenity as the waves murmur on the shore, and the purples deepen. This peaceful moment is the inspiration behind Evening Tides. 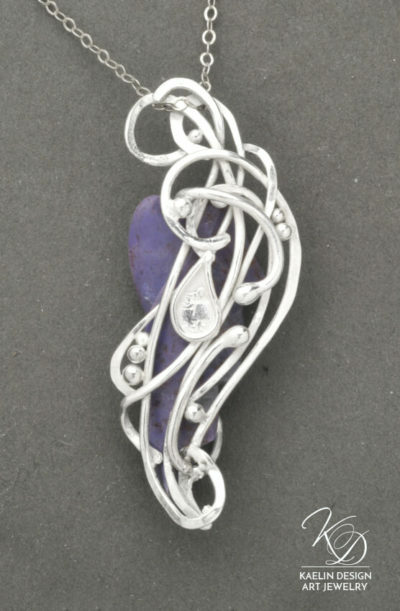 Hand forged in anti-tarnish Argentium silver, this unique art pendant features a stunning hand carved Purple Chalcedony cabochon. 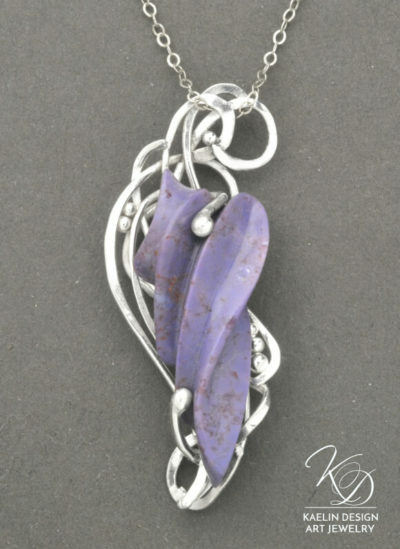 I lovingly framed this amazing stone in swirls of forged silver mimicking the tides, and curled the prongs around the stone like water droplets. This one of a kind pendant measures 2 inches in length, and includes an 18 inch Argentium Silver chain.